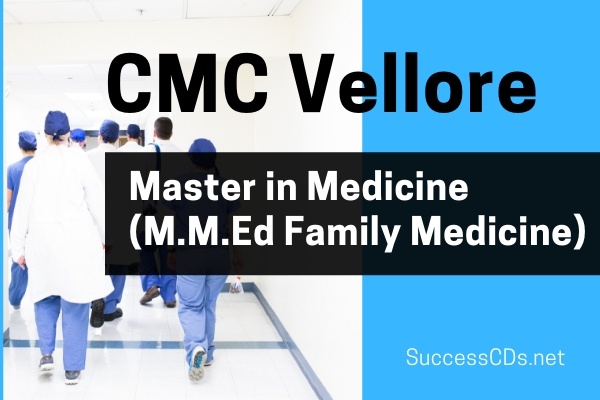 CMC Vellore Distance Education MMed in Family Medicine Admission 2019 - Applications are invited from the interested candidates by Department of Distance Education at CMC Vellore for admission into M.M.Ed Family Medicine 2019. The Master in Medicine in Family Medicine (M.Ed) is a two-year distance-learning course offered through the Department of Distance Education at Christian Medical College, Vellore and is provisionally affiliated to The Tamilnadu Dr M.G.R Medical University. Candidates must possess a valid MCI / State Medical Council registration. The course is only open to Indian Citizens who are currently residing in India. Family Medicine) offered by CMC are not eligible to apply for this course (M.MED in Family Medicine), irrespective of their completion status. Computer Based Entrance Test (CBT): - The initial selection process includes an entrance test (CBT) which will be conducted on 10th May, 2019 and will be based on the MBBS curriculum. The test centres for the CBT is listed in Annexure IV of this bulletin. The candidates can provide two choices for their examination centres in the application form. Allocation of the centre will be based on the first come first serve basis (i.e. preference will be given to applications received earlier). Up to 40% of the seats in the course will be reserved for women. Government/Quasi Government (including Armed Forces etc.) institutions and/or with Registered NGO hospitals. Selected candidates will receive a selection intimation letter by email. Once selected, the candidate is required to confirm his/her intent to join the program via email before 5 PM on 11th June 2019. If a selected candidate fails to confirm before the deadline, his/her candidature will be cancelled and the seat will be allotted to the next wait-listed candidate. All selected candidates will be required to submit scanned copies of the certificates listed below. Certificates numbered 1 to 9 are mandatory for all candidates. In addition, certificates numbered 10 to 15 should be submitted in special situations as described below. 1. MBBS Certificate –Only the MBBS Degree Certificate finally issued by the University will be accepted. (Provisional MBBS Degree Certificate will not be accepted). 11. Name Change Gazette – Candidates who have officially changed their name after MBBS completion should submit the Name Change Gazette issued by the State Government. Marriage certificates & Affidavits will not be accepted as name change certificate. On receipt of the soft copies, CMC will verify these documents and the candidate will be contacted if there are any discrepancies. The candidate will be permitted to proceed to the next step (Step 3: Original Certificates verification stage) only if the soft copies submitted meet the stipulated requirements. University registration process is completed. This process can take up to 6 months depending on the University procedures. Upon completion of the registration process at the University, the original certificates will be returned by courier or can be collected in person. Selected candidates are expected to comply with these procedures until the University registration is complete. Candidates who are not able to submit the required original certificates within the stipulated time will forfeit their candidature.